It’s late, I’ve just plugged the Google Home voice assistant in, and I’ve got a fridge full of pumpkin and pie crusts and Thanksgiving is three weeks away. “Okay Google, how do I make a pumpkin pie?” Google Home happily answers my question, firing off a summary of the instructions as told to it by AllRecipes.com. If I could whip eggs and beat canned pumpkin in the thirty seconds it took Home to recite the recipe, I’d have had a pie. Instead, I nod, wowed that Home can answer my question with ease, but also a little dissatisfied. It’s brilliant—so close to perfection that the minor imperfection nags. 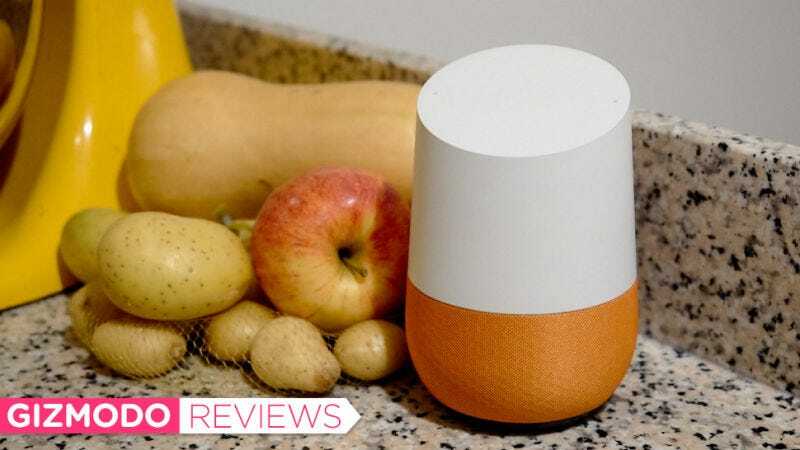 I follow up with, “Add everything I need to make a pumpkin pie to my shopping list.” It takes me literally, and adds a single entry to my shopping list: “Everything I need to make a pumpkin pie.” Google Home, like every robot sidekick you’ve seen in a sci-fi movie, is incredibly literal. It can do amazing things if you know how to ask the right question, but it exaggerates your every failure reminding you that the Skynet apocalypse is still a vague point far in humanity’s future. The new $130 digital home assistant and speaker from Google, and rival to Amazon’s Echo, can tell me the time, the weather, and how long it will take to get to work, but when it stumbles, the failures are often spectacular. It can’t add the ingredients of a pie to my shopping list, and it apologizes when I ask what time a TV show is on. It’s the best version of this future we’ve ever seen, but it’s still not the future it needs to be. It’s worth noting that everything that makes Google Home great will also creep the hell out of people. Home’s smarts are powered by the AI Google has developed by harvesting untold galaxies of data over the years. If the Google siphon makes you uncomfortable, then imagine adding yet another node to Google’s omnipresent network listening to your ever desire in your living room. Make no mistake, Google Home is a major step up from the Amazon Echo. Despite being $50 cheaper. It’s smaller and more unobtrusive, with customizable speaker grills (Google sells six options for $20 a piece online). While the Echo is perfectly at home by my giant garish Asus router, Google Home looks more welcome on my kitchen counter, or by my bedside. It’s easy to make quick adjustments when I’m near it, too. Instead of a physical dial and bright and alarming ring of teal and blue lights, the top of the Home responds to touch and has four lights that glow white when adjusting volume, or red, blue, yellow, and green when Home is engaged in a query. Music sounds richer coming out of the four speakers at its base than it does out of the two crammed into the tall tube of the Echo. There’s a distinct thump of bass and vocals are crisp compared to the Echo. The difference between the two disappears when you crank the volume on the Home all the way up. Playing music at max volume on the Google Home should be a crime. Everything but the tone of voices turns into a muddled mess. Jacking the volume up also makes it impossible to communicate with Google Home. It can’t hear the singular activation phrase (“Ok Google”) over the cacophony bursting from its base. You will need to get up to adjust the volume or go into the Google Home app on your Android or iOS device. The app doesn’t offer a lot of choices beyond that. You can link and customize compatible Chromecast devices (my Nvidia Shield worked but my Vizio P-Series wasn’t compatible), choose news sources, and link to the three smart home services currently compatible with it. If you have a Samsung SmartThings hub, Nest, or Philips Hue lights then it’s very simple to get them working with Google Home, and, at least in the case of the Hue lights, the integration is smoother with Home than with Amazon Echo. Part of the charm of Amazon’s assistant is how it seems to work with everything, not just the three partners Google has. Yet while the Echo can, theoretically, order you a pizza or an Uber or turn off the lights in your kitchen, in practice it often fails. When I ask something of the Google Home that is in its realm of capabilities, it never misses. It’s easy to adjust the lights in my basement without modulating my voice and uttering every syllable like a robot. It also never asks for a clarification if I trip over a word or speak too fast. Google Home is an impersonal robot with as cool a voice as you’ll ever hear from a digital assistant, but it gets me. Which is why Google Home can be so damn frustrating. It’s such a natural evolution from the limited, carefully programmed responses of the Amazon Echo that when it fails, I’m a little more let down than I should be. I ask it what film noir is and then ask it to play an example on my TV, and it immediately obliges, but if I ask it to suggest a film, it hangs, a ring of colored lights going round and around the top of it. Again and again, even as I’m enchanted by Google Home’s speed and strong grasp of my words—even when slurred after too many margaritas with friends—I’m also flabbergasted by its perceived stupidity. It fits quickly and naturally into my daily routine, but much like the Amazon Echo before it, I find myself annoyed by its failures. But there’s hope. “Sorry, I don’t know how to help with that yet,” Home tells me. The “yet” is key. Like the Echo the Google Home is expected to get constant updates over the coming years. It’s only going to become smarter and more capable. One day the Google Home will be the smartest and most user friendly computer in your home, but until then, it’s just an upgrade to the Amazon Echo. If you want to make like Kirk and Picard and have your own nebulous robot assistant, then right now Google Home is the right choice. It understands context, but only with very simple questions. Manage (lower) expectations. Audio is a major improvement over the Amazon Echo, but the difference disappears at higher volumes. It understands you better than the Echo—even when slurring or stuttering. It still can’t do everything. Which makes its failures maddening. The current champ of voice assistants. Can Google Home Really Kill the Amazon Echo?